Conservative firebrand Roy Moore beat the President Trump-supported Luther Strange in the Alabama Republican special election runoff for the U.S. Senate Tuesday night, according to The Associated Press. The defeat of Strange -- who currently holds the seat up for grabs -- is widely considered a blow to the president and a win for many of the most conservative members of his base. Moore tweeted that the establishment was "defeated" Tuesday night. 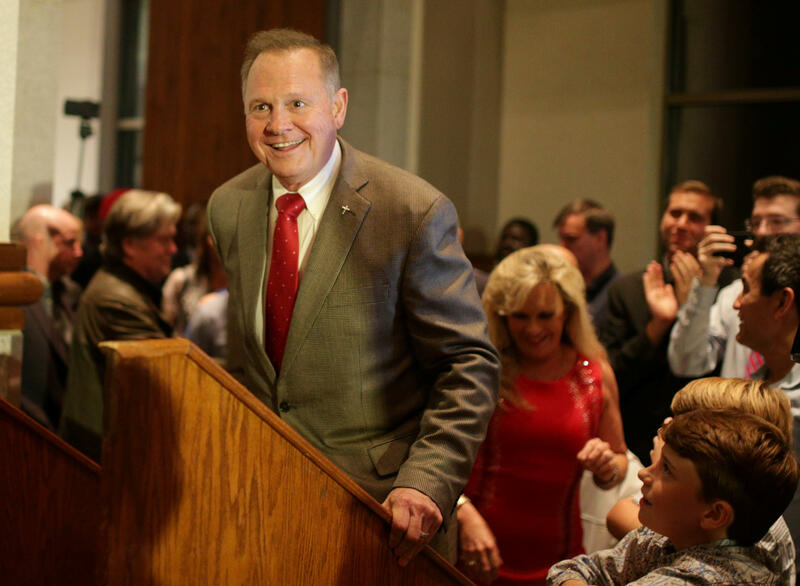 In his victory speech, Moore emphasized bringing the country back to God, and unifying the country under God. CONSERVATIVE VICTORY HAS COME TO #ALSEN! Because of you, tonight, the establishment has been DEFEATED in Alabama! Former chief Trump strategist Steve Bannon introduced Moore at his victory party, saying a vote for Moore was a vote for Mr. Trump. Moore also indicated his support for the president. "Don't let anybody in the press think that because [Mr. Trump] supported my opponent that I do not support him," Moore said. The president congratulated Moore on his primary win, although he did not respond to shouted questions from reporters Tuesday night. Mr. Trump deleted some tweets he had written in support of Strange after Moore's win. Strange made it clear that — while he believes he ran a good campaign — the president is in no way to blame for his loss. "I'm not going to lose any sleep tonight. We did the right thing, we did it the right way," Strange said in his concession speech. Strange thanked Mr. Trump for taking a chance on him. "That's what loyal friends do," he said. Strange said he takes "full responsibility" for his loss, and it isn't the president's fault. The Alabama Secretary of State's website showed Moore getting 54.89 percent of the vote and Strange attracting 45.11 percent, but noted that the results still weren't official. Moore will run against former U.S. Attorney Democrat Doug Jones in the December general election to replace former Sen. Jeff Sessions. Alabama's disgraced governor appointed Strange to the position, and Strange will remain there until after the December general election. The race pitted Mr. Trump against some of his top supporters. For instance, Ben Carson — the conservative Department of Housing and Urban Development secretary — allowed Moore's campaign to release a statement praising the former judge hours before Mr. Trump took the stage to hold a rally for Strange in Huntsville, Alabama on Friday. Moore also had the support of some of Mr. Trump's former allies, including Bannon, Sarah Palin and Sebastian Gorka. Mr. Trump campaigned for Moore, although he said on Friday he would return to Alabama to urge people to vote for either Republican victor against the Democratic opposition. Mr. Trump even suggested on Friday that he might have made a "mistake" in supporting Strange, as Strange stood not far away in a rally held in his honor. Moore is a former Alabama Supreme Court judge who supports smaller government, stopping immigrants who come to the U.S. illegally, and banning homosexuality in the military. The Alabama Secretary of State said Tuesday there were reports from polling locations of poll workers helping people who voted in the Democratic primary cast ballots in the Republican one. "This letter is intended to serve as a reminder that this is voter fraud," the secretary of state said in a letter posted online.